One of the greatest pleasures for hams who own portable rigs like the KX2 or KX3 is taking them to places without AC power. This requires a battery of some sort, whether internal or external to put us on the air. Hams are in general very resourceful and have found many different battery types, chemistries and form factors to serve as portable power sources. We will not be doing an in-depth discussion about the characteristics of the different chemistries, but those interested in the subject can find a lot of great information on line like the Battery University at www.batteryuniversity.com Readers are encouraged to continue their investigation there, we will concentrate on tests of available batteries as suggested by members of the Yahoo Elecraft KX Group as well as units we have evaluated for industrial use. It has become commonplace for battery advertisements from overseas sources to be greatly inflated, indeed many of their claims are hard to believe. 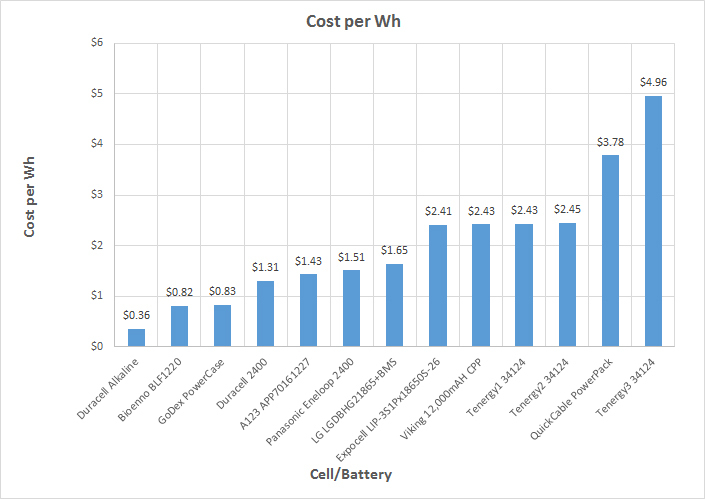 Other, perhaps more reputable battery sources advertise what many consider to be expensive batteries, and it makes you wonder if they represent a good value. Here at Pro Audio Engineering we like to let the data speak for itself, so we decided to purchase and test some of the batteries popular with hams. 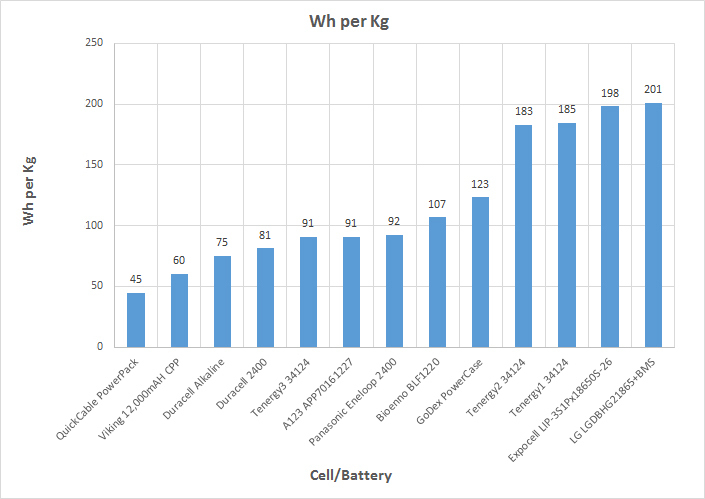 In order to more easily compare the performance of the different batteries, we present the results in table form, and summarize a few of the important comparisons in graph form. We used all recommended chargers or chargers supplied with the batteries, and where new performed two charge/discharge cycles to 20% before testing. All tests were performed using a Maynuo 9713 600 W Electronic Load with the Battery Test software. All screen shots are of this software. Test end voltage was set to manufacturer’s recommendation for each chemistry, excepting for some of the LiFePO4 batteries which varied, but an analysis of the charts show there is very little error induced by this parameter with these cells. 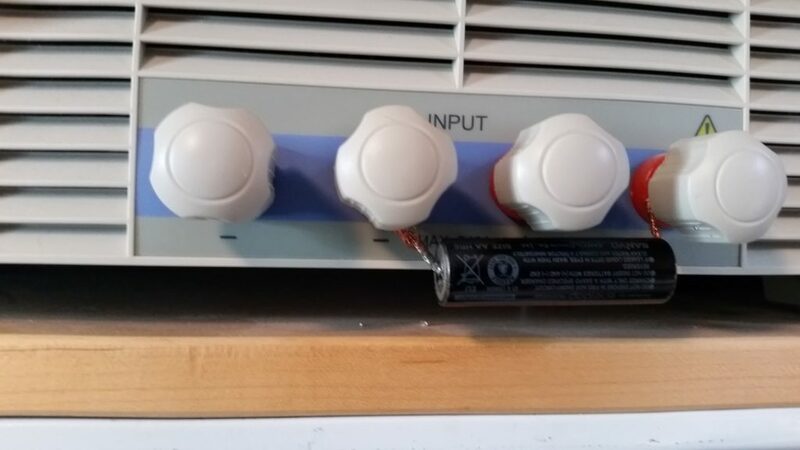 Testing of all batteries was done with as short as possible leads directly to the load. Testing of AA cells was initially done with 8 Eneloop cells in a KX3 battery holder, but the performance was not what we expected, so all further testing of AA cells was done by testing a single AA cell with very short, soldered 12 ga. leads as shown below to take the holder out of the equation. We then averaged 4 cell characteristics, and multiplied applicable ones by 8. We tested each cell/battery at four current levels: 320 mA, 1300 mA, 2100 mA, and with a TR Cycle test. The TR Cycle test alternates between 180 mA and 1.8 A to emulate a KX2/KX3 in constant but close to normal QSO receive/transmit use. We feel this Ah rating gives the best comparison between batteries. This being said, the column “mAh actual % of advertised” compares the test result giving the highest mAh rating with the advertised rating. The test results are summarized on the tab “Summary Table.” Charts showing relative performance are on the “Summary Charts” tab. In order to see the full test results for any individual cell or battery, click on the “Individual Test Results” tab. Below is a table summarizing all of the test results. You can click on any column to sort, to see the full test results for any individual cell or battery, click on the “Individual Test Results” tab. Try sorting for ‘mAh actual % of advertised’ and it unsurprisingly sorts for name brands. As you can see from the results, the tested mAh capacities were reasonably close to advertised capacities for the major name brand NiMH. LiIon, and LiFePO4 batteries, and not so much for the imported inexpensive ones. The phrase “if something seems too good to be true it probably is” comes to mind. 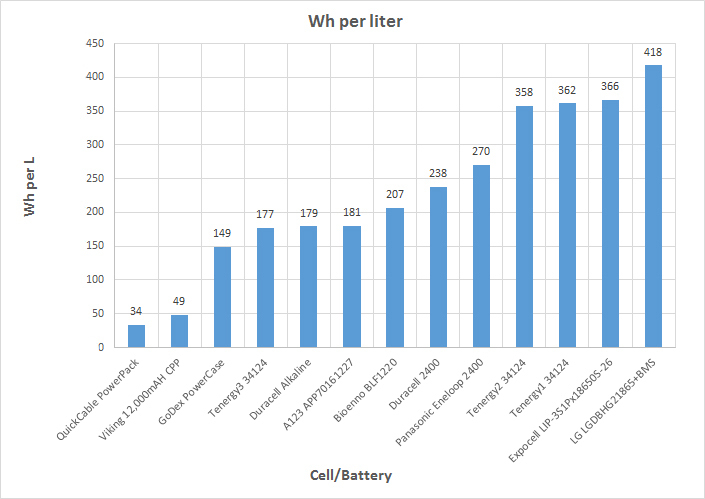 It is interesting that disregarding the Duracell Alkaline which are unsuitable for transmit duty, the most expensive battery tested (Bioenno 20Ah) in addition to having the tested Ah closest to the advertised Ah, also has the lowest cost per Ah. The next closest (GoDex PowerCase) despite delivering only 17% of advertised capacity has a low cost per Ah because it was so inexpensive ($23 on eBay). 1. Cost per Wh. Shows how much each watt-hour costs you. Lower is better. 2. Watt-hours per kilogram. Shows how much energy you get per kilogram you are carrying. Higher is better. 3. Watt-hours per liter. Shows how much energy you get for the size of the battery in liters. Higher is better. 4. Run time in TR Cycle test. 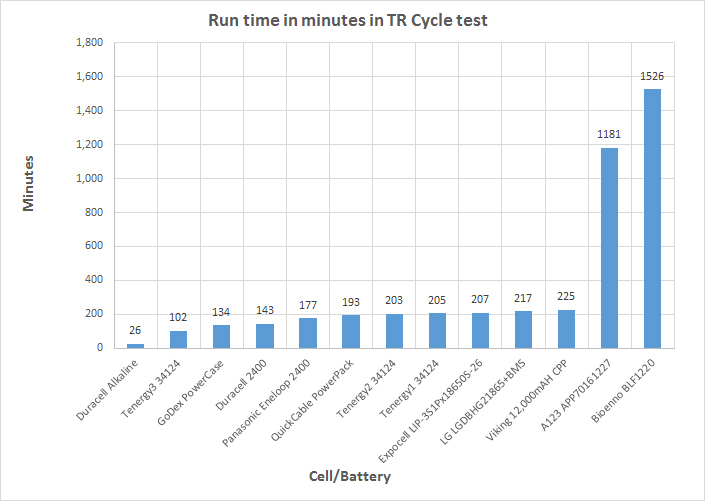 Shows how much time each battery ran in our TR Cycle test. Higher is better.